It probably started out as hair for the gods in India. For Hindu followers it is an act of devotion, but at the Thiruthani Murugan temple and others across India there are millions to be made from heads that are shaved and smothered with tumeric paste. Some days there are hundreds of disciples waiting before dawn at the hilltop shrine west of Chennai to take part in the centuries-old traditional offering to the gods. As they ask the deities for good fortune and health, temple attendants collect the locks for sale to be used for wigs or fashion industry hair extensions. India has long been the world’s biggest exporter of human hair — in money terms — and businesses say the country earns several hundred million dollars a year from its high quality locks. China and Russia are serious rivals in terms of volume. European countries are the biggest customers, but a lot is also sold in the rest of Asia, the United States and even Africa. There are about 10 major temples, and other smaller ones, in India with a cut of the market. Some villages also collect their inhabitants’ hair. The most expensive type — capturing a quarter of the overall market — is hair shaved directly from the scalp of one donor. The rest — cheaper cuts sourced from comb waste — fetches a lower price. Some temples make pilgrims braid their hair before it is cut so that the locks all face the same direction. 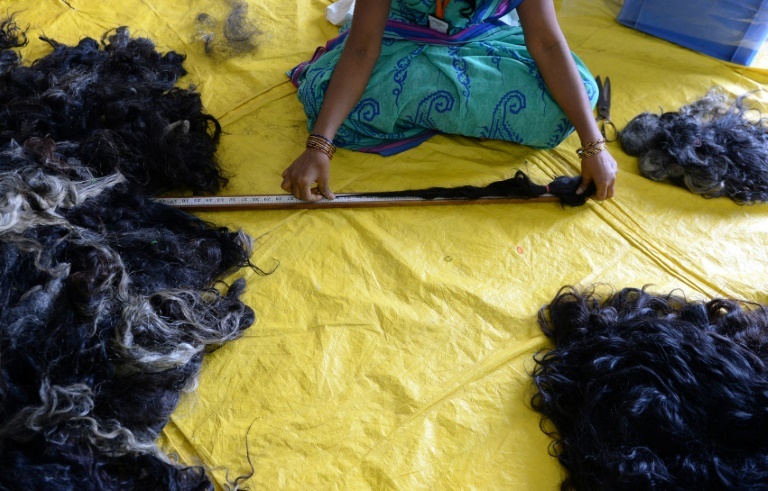 The hair collected at Thiruthani Murugan is auctioned to processing plants which sell the finished product as all-human wigs or hair extensions. Business has to move quickly at the temple, one among the six holy shrines of deity Lord Murugan. From four in the morning to sundown barbers clip away. Pilgrims queue for hours, sometimes much longer on festival days, to make their sacrifice. Tens of thousands, including women and children, shave their heads here every year, applying a bright yellow paste of tumeric powder before offering their prayers. Pilgrims climb 365 steps to reach the shrine, which is open year round. The profits from the sale of their hair goes towards the upkeep of the temple.